I am a professionally trained Funeral Celebrant based in North Norfolk. I have a NOCN Level 3 Diploma in Funeral Celebrancy and I am a member of the Institute of Civil Funerals (IoCF) and The Good Funeral Guild. I have achieved the highest possible qualification in Funeral Celebrancy having been rigorously assessed for my skill and suitability as a Funeral Celebrant. My role is to offer bereaved families a funeral ceremony that reflects the wishes, beliefs and values of the deceased and their families. The ceremony will focus on commemorating the life of the deceased and will include a personal and respectful tribute. 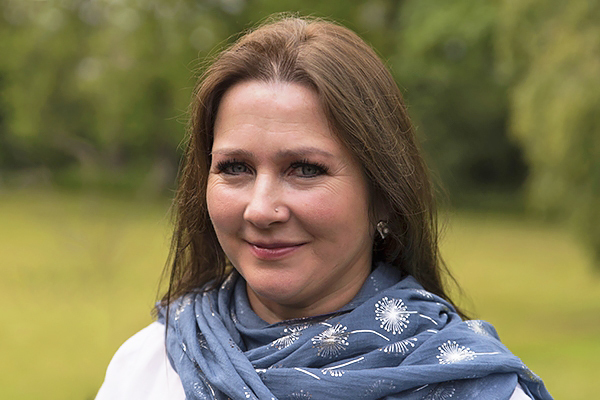 I come from a professional background as a Registered General Nurse and I am a warm, compassionate person. You can have every confidence in trusting me to create a meaningful and truly personal funeral ceremony for your loved one. The ceremony will capture the very essence of the person and tell the story of the life that has been lived. Whilst not a religious ceremony as such, religious content may be included, a prayer or a hymn perhaps. You will be able to check the ceremony content before the funeral and I will give you a full copy of the text of the ceremony for the family to keep. Contact me directly, or give my details to your Funeral Director, and let me know how you would like the funeral and I will provide a memorable meaningful ceremony for your loved one. If you are booking me via a Funeral Director, please ask them to check my availability prior to making further arrangements. There is a growing demand for these types of ceremonies and feedback from families is excellent, expressing heartfelt thanks for a ceremony providing the funeral they believe their loved one would have wanted. I also offer Memorial, Scattering of Ashes and Celebration of Life ceremonies. A Celebration of Life ceremony is for individuals who want to be present, and indeed be the centre of attention, at the last celebration of their lives. It is a time to honour and appreciate the living when they are near the end of their lives through age or illness. They want to enjoy their own funeral and the opportunity it gives them to see, perhaps for the last time, their friends, relatives, former colleagues, neighbours and all those whose lives have touched theirs. I can also offer a Funeral Wishes service for those who are well organised and would like to plan their own funeral ceremony in advance. Losing a loved one is never easy. As a Funeral Celebrant I often find myself talking with bereaved families about their choices regarding cremation ashes of their loved one. I began to explore the possibilities of what can be done with cremation ashes, and in researching what has happened historically I was fascinated to learn more about ‘mourning jewelry’. Although memorial jewellery as we know it today wasn’t introduced until the 1990s, its predecessor, mourning jewellery, has been around in one form or another for nearly 2,000 years. In 16th and 17th-century Europe, for example, rings and brooches set with black and white enamel represented a style of jewellery known as ‘memento mori’, a Latin phrase meaning “be mindful of death” – a reminder of the fleeting nature of life. Among the wealthy class of the 17th and 18th centuries, mourning rings were presented to friends and families of the deceased. When Prince Albert of England died in 1861, his widow, Queen Victoria, went into mourning for the rest of her life, a period of 40 years. The Queen and her court dressed in elaborate mourning clothes and followed a strict code of conduct, and her loyal subjects mirrored this behaviour when their own loved ones died. Mourning jewellery became very popular in Victorian England. I began to explore memorial jewellery in the present time and found myself a little disappointed in the range and quality available. Then I came across the beautiful range of See You Memorial Jewelry and Dutch designer Rob Leurs at the National Funeral Exhibition and found the affordable yet high quality pieces I was looking for. I then journeyed to the Netherlands to meet with Rob and his family, view the full range of See You Memorial Jewelry in their stylish showroom, and learn the skillful process of setting the ashes into the jewellery. 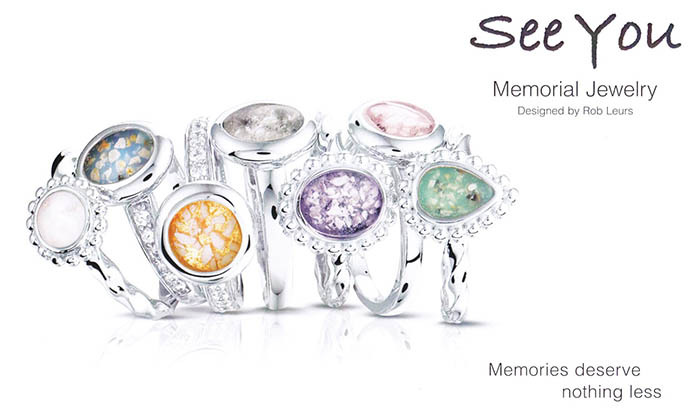 I am very pleased and excited to now offer the full See You Memorial Jewelry range. Clients can be in attendance when the ashes are set in the jewellery if they wish. There is a stunning collection of pendants, rings and bracelets to choose from and I am proud to offer jewellery that will be enjoyable to wear and treasured. Please visit my See You Memorial Jewelry page for further information and to order from this exquisite range of jewellery.